1. B. S: Ingemann's text "Glade Jul!" The Danish poet Bernhard Severin Ingemann (1789 - 1862) Why the Danish poet Bernhard Severin Ingemann (1789 - 1862) wrote his Christmas carol "Glade Juul! deilige Juul" in 1850 is not known. 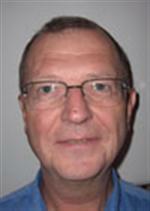 The text, which was written to Franz Gruber's melody of "Stille Nacht", is not a translation of Joseph Mohr's text, but it is most likely that Ingemann was inspired by it. Ingemann's text was published for the first time in the Danish periodical Dansk Kirketidende Nr. 270, December 8th, 1850 to Franz Gruber's "Stille Nacht". Since then Ingemann's text has been one of the most popular Christmas carols in Denmark and Norway, which is possibly also the reason that Joseph Mohr's original text "Stille Nacht! Heilige Nacht!" has never been in common use in these two countries. First printing of Ingemann's text "Glade Jul"
It was in the year 1843 that the Danish composer, organist and school teacher A. P. Berggreen (1801 - 1880) included "Stille Nacht" in the 2nd volume of his collection of folk tunes Folke-Sange og Melodier fædrelandske og fremmede. The music and the text of the song in Berggreen's collection is identical with the version published by Friese in Dresden 1833 (which Berggreen actually quoted as his source): four voices, with piano and/or guitar accompaniment. Neither composer nor author was named, it was simply called "Weihnachtslied aus Tyrol". It was the version of Gruber's tune in Berggreen 1843, which was used when B.S. 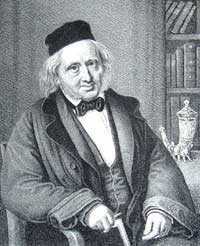 Ingemann's new text was published for the first time in 1850. Except for a significant difference in the third verse, and some changes that had to be made to adapt the music to a new text, it is basically the same version of the tune as found in Berggreen 1843. Already in 1852 Ingemann's text was included in Roskilde-Psalmebogen (a proposal for a new hymn) in a revision probably by Ingemann himself or at least with his permission. In 1855 it was included in the hymn approved by the government for use in the Danish Church (Psalmebog til Kirke- og Huus-Andagt) also here with some changes in the text. Since then it has been widely represented in all sorts of hymns and song books, despite the severe criticism against the theological implications - or lack of implications - in the text. Ingemann's text has never been translated into another language in a way that fits into Gruber's tune. To give a certain idea of Ingemann's text, I therefore quote the first verse in a word-by-word translation by Mike and Else Sevig (the translation has been made from the Norwegian version, which, in some parts, differs slightly from the Danish original): First printing of Ingemann's text "Glade Jul"
The angels walk in our midst unseen. Ingemann's text with Gruber's music was very quickly adopted in Norway. 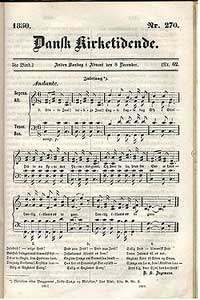 In 1851 - less than a year after it was published in Denmark - it was printed in Johan Diederich Behrens' (1820 - 1890) school song book Skole-Sangbog indeholdende to- tre- og firstemmige Sange. Except for a couple of significant changes (e.g. "hellige Jul [holy Christmas]" instead of "deilige Juul [wonderful Christmas]" in the first verse , Behrens only changed the spelling of some words to adapt the text to the officialyl written Norwegian language, which at that time was very similar to written Danish. The song became very popular also in Norway, but it was not until 1926 that it was included in the official hymns for use in the Church of Norway. Øyvind Norheim, MA in musicology, is working as a research librarian at the "National Library of Norway" in Oslo and member of the Silent Night Association, Norway 2006 As early as 1845 A. P. Berggreen had published a Danish translation of the three verses of Joseph Mohr's text in his Skole-Sangbog, til Brug ved den første Underviisning. It was the same three verses he had used in his collection of folk songs three years earlier (taken from the Friese publication of 1833). Berggreen's translation (verses 1, 6 and 2 of Mohr's original version) was the only one in common use in Denmark and - to a lesser degree - in Norway for about the next hundred years, whenever a translation of Mohr's text was required. In Norway Berggreen's translation was probably printed for the first in 1864, also this time by Behrens in one of his song books for schools. The competition from Ingemann was however too tough and Mohr's text was never accepted by either the Danes or the Norwegians. It was not until after World War II that other translations started to appear. In Norway a translation by Erik Hillestad (1991) has been used to some degree recently. All in all a total of 15 different Norwegian and Danish translations of Mohr's text are known to the present author. But none of them has been a real threat to the popularity of Ingemann's "Glade Jul".